Season the cod fillet on both sides with the salt, pepper and dried sage. Set aside. Heat a saute pan over medium heat and add just 1 tablespoon of the butter. When the butter is bubbling and starting to get light brown, add the the chopped hazelnuts. Toast the hazelnuts in the butter, stirring constantly for 2 minutes. Remove the hazelnuts and let cool on paper towel. Keep the pan on the stove. Add the remaining butter to the hot pan and add the cod. Cook for 2 minutes on one side, then flip the cod fillet. Turn the heat to medium-low. Add in the cherry tomatoes to the pan with the cod. **Cover loosely with a sheet of tin foil and let cook for an additional 2-4 minutes, gently shaking the pan every so often to turn the tomatoes. 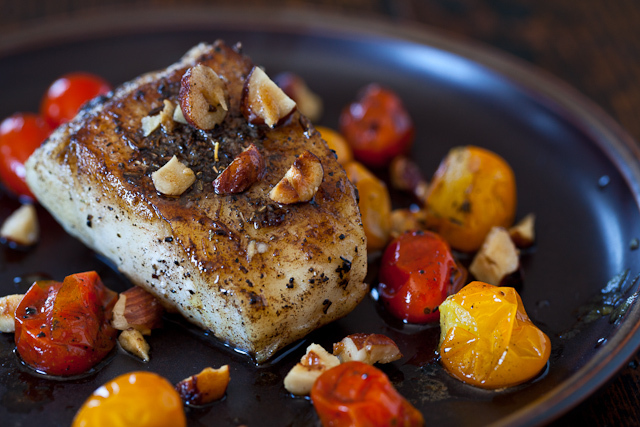 Serve the cod and tomatoes with chopped hazelnuts – make sure you drizzle a bit of the browned butter and sage olive oil on each dish.